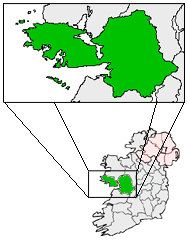 Sráidbhaile idir Indreabhán agus an Cheathrú Rua in iarthar Chois Fharraige i gContae na Gaillimhe is ea Casla (Costelloe as Béarla). Is ann atá ceannáras Raidió na Gaeltachta, mar aon le traschuradóir mór de chuid RTÉ. Tá beagán monarchan freisin sa cheantar. Tugadh an leathanach seo cothrom le dáta an 20 Aibreán 2015 ag 20:24.